From Underground Toys! The circle is now complete: here are Darth Vader-inspired barbeque tongs, perfect for turning your meat to the Dark Side! 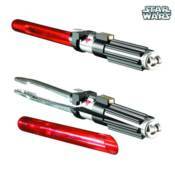 The tongs are shaped just like Vader's famous weapon with a heat-proof plastic handle, metal tongs, and red storage case. They also feature classic lightsaber sound effects so you can rule the barbeque as well as the galaxy!